Colors are an essential feature of web design and how they're used is a core consideration of a website's or app's accessibility. A term you may have heard is "color contrast," but if you aren't quite sure what that means, we have you covered. Their online presence is tied to a physical location. Their e-commerce functions are accessible to people with disabilities. They are maximizing SEO and website traffic through accessibility. Their emails, social media, and landing pages are also accessible. They are reaching every customer they could or excluding people because of the inaccessibility of their website or app. Some people think that creating an accessible website limits design and creativity; however, prioritizing accessibility can inspire beautiful and creative site design. Using color and images thoughtfully, for example, can make your site stand out. Here are 4 tips for creative site design with accessibility in mind. More than ever, companies are striving to innovate workforce and culture. Companies that aim to be diverse and inclusive of people with disabilities take accessibility seriously, and also recognize that accessibility is a civil right. Have you taken advantage of our on-site accessibility training? Larger groups. Smaller, more intimate sessions. Teleconferences. Designed to meet your needs. We offer an on-site accessibility training program for organizations that desire to build understanding and self-sufficiency in digital accessibility. Should you have a separate accessible website? We believe that creating a separate website for people with disabilities is a form of segregation and can be discriminatory, and we advise against it unless there is absolutely no way around it. If you asking if you should have a separate accessible website, please also ask yourself these questions. The most obvious benefit of web accessibility is that it helps people with disabilities enjoy your website’s content, products, and services. However, the advantages of web accessibility aren’t limited to their immediate impact for people with disabilities — and some of them may surprise you. Here are 6 additional benefits of web accessibility for your organization, your employees, and your customers. Ensuring your website is accessible is imperative for business, legal, and practical reasons, but it can be hard to know where to start, especially if technical requirements and testing aren't your strength. Here are some quick ways to check the accessibility of a website. If you experience difficulty with reading, memory, focus, or problem-solving, and that difficulty interferes with your ability to easily consume web content, you're not alone. Whether you identify as having a cognitive disability or have temporary or minor challenges understanding digital information, some of these tips may help you. We Already Fixed Our Website for Accessibility - Are we done? A common web accessibility myth is that accessibility is a one-time fix. Companies sometimes believe that because their website or app was built to be accessible or, more likely, was tested and fixed in the past, that the task of thinking about accessibility is complete. It isn't. Accessibility requires monitoring and maintenance. Motor disabilities manifest themselves in different ways for each person. Symptoms such as pain, tics, tremors, problems with fine motor skills, and paralysis can change in intensity over time, depending on the disorder. If you have any trouble using a mouse or want to discover options for making web browsing easier, check out these 3 tips. As they’ve been designed today, standard input devices such as keyboards and computer mice need a high degree of fine motor control skills. Many people barely give this fact a second thought, but for others it poses an everyday challenge. Fortunately, traditional keyboards are far from the only way that you can enter text and navigate the web. If you're looking for enhancements you can make so surfing the web is a little easier, please check out and consider these tips. From breaking news videos to audiobooks, multimedia content is increasingly important to people’s activities online - and by 2021, 80 percent of the world’s internet traffic will be video. Unfortunately, when that content isn't made to be accessible, much of it could be lost to people with hearing disabilities. If you need or want to make adjustments to your web browsing experience, check out these tips. Laws like the Americans with Disabilities Act (ADA) require that website content be made accessible to people with disabilities. 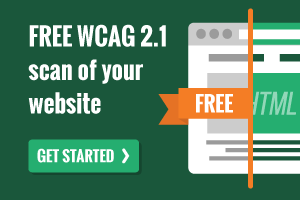 Unfortunately, most websites don't currently meet those standards — and even when websites do comply with standards like the Web Content Accessibility Guidelines (WCAG), you still may require or prefer modifications to help. If you have trouble seeing or reading the material on websites, there are some actions you can take to improve your experience and make it easier. This is part one in a five-part series about adjusting your web browsing experience to better-suit your needs. Not all web accessibility testing is created equal, and not all of it needs to take a lot of time and money. In fact, you can start to get a sense of the condition of your website almost immediately using some of these tools and methods. Let's get started. How Do We Perform Accessibility Testing for the Impact of Speech Disabilities? This is the fifth and final piece of our series dedicated to sharing a bit of what we look for when testing websites and apps to identify the accessibility barriers people with certain disability types may experience. Take a peek at how we test for the impact of speech disabilities. How Do We Perform Accessibility Testing for the Impact of Physical Disabilities? This article is the fourth in a five-part series dedicated to sharing what we look for when testing websites and mobile apps to identify the accessibility barriers that might affect people with certain disability types. Here we look at accessibility testing for people with physical disabilities. How Do We Perform Accessibility Testing for the Impact of Cognitive, Learning, and Neurological Disabilities? Series: 3 of 5. This article is part of a five-part series that highlights some of what we look for when testing websites and apps to identify the accessibility barriers people with certain disability types may experience. Check out how we test for cognitive, learning, and neurological disabilities. Over 500 million Tweets are sent each day, representing roughly 347,000 chances each minute to reach the masses or to exclude large groups of people through inaccessible or difficult-to-understand content. Here are some tips to help create more accessible Twitter content. Where Should You Start with Web Accessibility Fixes? Somewhere. The sooner you incorporate accessibility into your website and app plans, the easier it will be to create accessible experiences for your customers. So, what if your digital presence is already fully-built and hasn't been designed with accessibility in mind? Is it too late? Where can you even start to make your site more accessible? Getting accessibility buy-in at work can make the difference between creating websites and apps that are usable and understandable to everyone, or preventing large segments of people from learning about your company and purchasing its products and services. But how do you achieve web accessibility buy-in?